MIT does not use the Common Application. 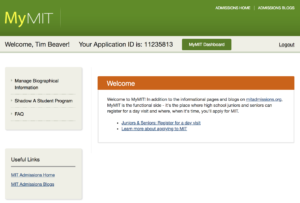 Instead, first-year applicants use our custom MyMIT application, which lives at my.mit.edu. MyMIT is not only where our application lives, it’s also where you tell us that you would like to know more about MIT. So if you plan to apply, you should definitely register for MyMIT. Actually, even if you’re not sure if you’re going to apply, you should still register to keep up to date on MIT admissions info! What does registering for MyMIT do for you?